(VEN) - Vietnam should prepare infrastructure and human resources to absorb some of the US enterprises planning to shift production from southern China due to trade tensions between these two economic giants. This was the message delivered at a recent seminar in Ho Chi Minh City by Marie Diron, managing director of the Moody’s Asia-Pacific Sovereign Risk Group. A survey conducted in late 2018 by the American Chamber of Commerce found that more than 70 percent of US firms operating in southern China are considering delaying further investment there and moving some or all of their manufacturing to other countries, among them Vietnam. This emerging trend is just one of the elements auguring the growth of US trade and investment in Vietnam almost 25 years after they began. Since the two countries established diplomatic relations in 1995, two-way trade has grown from US$500 million in 1995 to US$50.8 billion in 2017 and a similar level is estimated for 2018. Currently, there are 886 US investment projects in Vietnam with total registered capital of more than US$8.96 billion. US Ambassador to Vietnam Daniel J. Kritenbrink said at the seminar that many world-class US companies have invested in Vietnam, such as Microsoft, Cisco, FedEx, Coca Cola and Visa, promoting the integration of Vietnamese businesses into global supply chains. US investors have also helped Vietnamese businesses increase productivity, enhance efficiency and safety, and improve competitiveness. 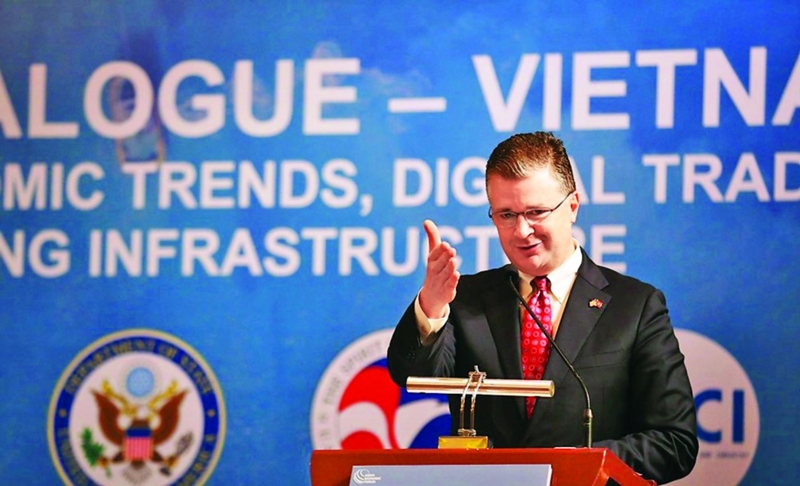 “The US is committed to supporting the development of a strong, prosperous and independent Vietnam that contributes to international security, engages in free, fair, and reciprocal trade, and respects human rights and the rule of law,” Kritenbrink noted. The US is also seeking ways to reduce its trade deficit and promote fair and reciprocal trade between the two countries. “We have identified energy as a priority sector of opportunity for US exports and investment in Vietnam, including power generation, oil and gas exploration, liquid natural gas (LNG) imports, and wind and solar power,” he noted. The US is also committed to working with Vietnam to help Vietnamese small and medium-sized enterprises (SMEs) adapt to the modern global economy. The US Agency for International Development (USAID) recently launched a five-year, US$22 million project that aims to improve and expand the supplier-buyer relationships between Vietnamese and foreign firms. The LinkSME project will enhance Vietnam’s capacity to supply products to larger companies both inside and outside Vietnam, and benefit foreign firms in terms of more efficient local sourcing. LinkSME will help Vietnamese entrepreneurs pursue new opportunities and provide new jobs for their communities. The US and Vietnam have also worked closely in multilateral forums such as APEC, ASEAN and ARF, contributing to peace, cooperation and development in the region. The two countries agreed to strengthen ASEAN-US relations, and consolidate ASEAN’s central role in the region. The US has maintained its commitment to economic cooperation with the Indo-Pacific region. Over the past decade, foreign direct investment by US companies in the Indo-Pacific region has doubled, reaching US$940 billion. Deputy Minister of Foreign Affairs and Vietnamese Former Ambassador to the US, Pham Quang Vinh, said the US intends to strengthen cooperation with regional countries such as India, Japan, Australia and the Republic of Korea, and Vietnam hopes to help the US do so. to the 25th anniversary of the normalization of bilateral ties.